Need a new, 34GK950G-B or AW3418dw? Discussion in 'Displays' started by fisker770, Jan 17, 2019. And the alienware has a big issue with flickering when you OC the monitor. Many reports around. And i dont want to do the hassle sending it back etc. Lets pretend they cost the same.. which one should I go for? That flicker - I just switched to a 3418dw myself and it's definitely true. At OC refresh rates it does flicker. Sure it's a bummer I can't get 120 but 115 isn't too bad. I'll trade off everything at max and a lower refresh rate any day. As long as it's consistently above 60 or maybe 75 - I'm a happy camper. I don't have any experience with the LG to offer info but another factor would be your use case and preference. If you like the colors on one vs the other.and does GSync mean anything to you? Now that variable refresh rate on Pascal/Turing is a thing, you might be able to expand your search to non-Gsync / Free sync only monitors as well. FWIW! lol . haha thank you so much dudes! You aren’t guaranteed 120hz, you are guaranteed 100hz. That’s why they sell it as an overclock. But most people do get 120hz without flicker. Heck I can’t tell the difference between 75Hz and 144hz in my gaming testing with two nice Freesync monitors. Both felt buttery smooth. If you turned Freesync off I could tell, but not with Freesync on. FWIW, the F version of the LG 34" ultrawide with latest firmware basically removes any rational reasons to pay $200+ extra for the G version: Input lag + pixel response is now in the same "pro gamer" class (previously had like 10ms extra processing delay vs basically none on gsync module) has native 144hz instead of 120hz OC, works fine with gsync, does not lock you out from adjusting to normal gamut colors if you want them. Its a fair bit pricier than the AW though, 1k is the cheapest recent sale I've seen. If you like wider gamut gotta pay for it. From TFT. The Alienware AW3418DW 34” still has less input lag than most gaming monitors including the LG you champion, 4ms vs 14ms total (input and pixel combined). If that’s discernible or not is a valid question — but there is a difference and I wouldn’t say that LG is clearly in the “pro-gamer” category based on this lag chart. 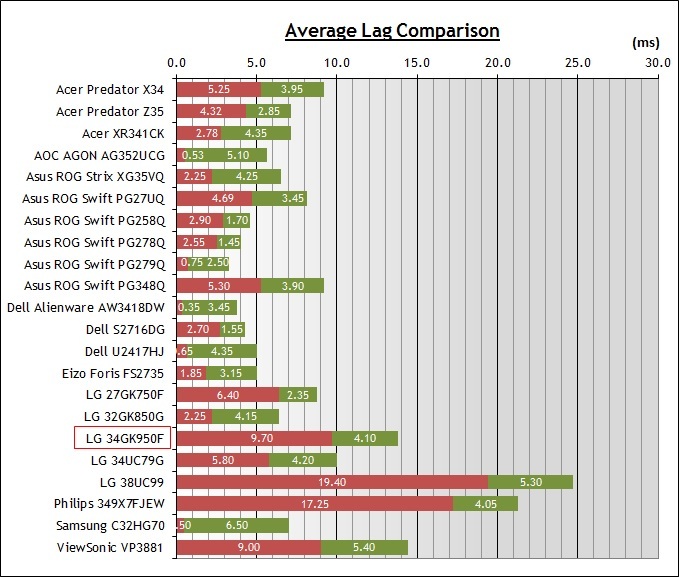 I would say the LG is perfectly acceptable for gaming based on my own subjective tastes and requirements at that 14ms. AW3418DW owner here. Mine overclocks to 120. Also I know for a fact if it ever doesn't - Dell advance ships replacements for you. It also has incredibly low lag as the previous person before me shows. Not to mention is regularly 800$. The monitor is a no brainer. I paid 1000$ for it and I have zero regrets. I bought a colorimeter for it as well and it benefits heavily from that due to the poor calibration out of the box. Gamma control in the OSD is obviously preferred, but with Nvidia automatically applying .icc profiles to all games now - there is very little that should be holding people back at this point. Thanks for showing you didn't really read what I wrote, just skimmed it. Too busy running off to grab a chart to "be right" I guess? That test is from October, there is new firmware out that fixes this. LG 34GK950F Revisited - testing the new firmware, coming mid Feb"
They don't exactly test a lot a monitors (let alone re-test) as they seem to be rather picky about what they spend their expertise on. And then we can have nice new numbers to argue about. Several people who have already updated theirs seem to be happy with the change. That test is from October, there is new firmware out that fixes this. And then [when it's retested] we can have nice new numbers to argue about. Sometimes you get more when you pay more. Just not if you buy the gsync version. That's a great deal. I paid almost full price for mine and don't regret it. This is definitely superior to the G model as well now with the input lag reduced. Have Asus PG348Q its 10 bit and AW3418DW has 8 bit newer panel can overclock to 120hz. Seems each panel has its goods and bads features. I took the plunge and just bought the LG 34GK950F. I picked up it on Amazon, sold direct by LG. Will be here sometime next week, with free shipping. At $799 ($400 off) it was simply too good to pass up, with it being so highly reviewed. I'm taking the step up from my 2012 era Dell U2713H, and it will be my first ultra wide, curved, and > 2560 x 1440 for PC. cybereality, EvilViking and x3sphere like this. Grats on our new monitors! They're going to sell a ton of these at this price. Makes me sort of wonder why it's such a deep discount, as usually that indicates a need to clear inventory or older models, or that the sales items are refurbs. But the 34GK950F was just released in October, and these are new. And most user reviews/comments are positive. I did see some where people received bad panels, but in nearly all those cases an LG QC rep left a reply saying to contact them for a replacement. That's at least assuring, and why I went with Amazon/LG for return policy. I doubt I'll get a bad panel, but you can never be too certain. Placed my order last night, looks like Amazon raised it to $900 today. $800 was certainly at the high end for my budget, I don’t think I could have justified $1,000 or especially $1,200. But for less than $100 more than a 100hz VA monitor I couldn’t pass it up. I am one of those people that received a broken monitor. Got it back in November, came damaged just like lots of others experienced. I could tell it was a lot better than the AW though, so figured I would give it some time to work itself out. I actually was determined to get a different model altogether since I was put off by the experience. I got it for $949 then and thought it would have been good if it came in good order. This time I got it for $799 and added the $10 4yr warranty from ST... covers me in case the craftsmanship is just poor and it hits me down the road. Cant wait to hear what ya guys think when ya get your new monitors! Thanks, will try and post some pics of my setup when I receive it. Either here or up in pinned thread. $799 for the LG -F over the AW is a no-brainer if you are in the premium UW market, let alone any of the VAs. I wonder if the price drop is related to the upcoming 38" 24:10 model, that is going to stand in a league of its own for a bit. If they ditch FPGA-sync on the GL it could easily occupy the same original GK price slot. Hows does Samsung C43J89 compare? 43" 32:10 3840x1200 120hz. It doesn't have gsync or freesync. will that make a huge difference with a 1080ti? Seems like the closest to a gaming monitor in the >35" <49" size thats available right now. Personally I wouldn't even consider any monitor that doesn't have Gsync or FreeSync now. It makes a big difference even if you've got a good GPU. My 34GK950F arrived today... no dead pixels or damage like my last one! Some BLB in the lower left and a tiny bit in the upper left corners, but very livable overall. Can't complain... it's a keeper! Aluminum and gan7114 like this. Get some rear lighting and that back light bleed will disappear. Great to hear. How does the white uniformity look to your eyes? Blacks? Also, have you used the ICC profile from TFT? Let us know your impressions from games, etc. I'm curious how the DCI-P3 color space will affect me. I'm coming from a monitor that's capable of 100% Abode RGB, and that's a larger gamut than DCI-P3, especially at the green end of the color space. However, Adobe RGB is essentially useless unless you're using Photoshop and working in 10-bit with a Quadro or FirePro card. So basically, I've been accustomed to really over saturated colors for 8 years, haha. Practically speaking, DCI-P3 is a more useful color space. I did change the preset to sRGB and found that setting a fairly good default. The popping colors are nice in game, but during desktop use it's a little overwhelming. Also it came with brightness set to 100% which was shockingly bright... I think I settled near 20% or so. I did have to update the firmware out of the box to the newest one, and that took a good 15 or 20mins for the process to finish, but other than that... it's been good to go! Tell me what else to look for and I can give my opinion. So far, it's been great! Aluminum, cybereality and gan7114 like this. Hey Tweak, did you come from using dual monitor setup? What did you have before the 34" LG? Yes, I have another Acer 3440x1440 75hz Ultrawide which is staying as my secondary monitor. The LG replaced my AW3418HW (the 2560x1080 model). I think I can notice the small drop in refresh right now, but barely. I suspect I'll forget about it soon enough. I've had the AW3418DW for several months and haven't observed any flicker at 120Hz.